First responders must make good judgments, and that requires them to be well versed in potential dangers they may encounter at the scene of a fire or other emergency. 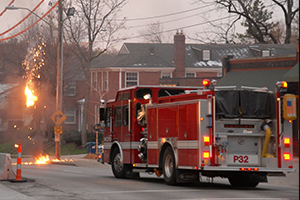 To protect the public, members of the police and fire service should not jeopardize their own safety, which can happen quickly when electric lines are involved. Electricity can be an invisible killer, particularly when overhead power lines have fallen and contacted vehicles or the ground. The wire may not be sparking or visibly indicating its lethal characteristics; however, it can energize other objects it touches and send a potentially deadly charge into the ground that will disable or electrocute someone approaching the wire on foot. Traffic accidents, high winds, ice storms, and other events can bring electric transmission and distribution lines within range of pedestrians and vehicles, and first responders have the challenge of not knowing whether a wire is energized. Emergency personnel trainers and utility professionals always advise police and firefighters to assume a downed wire is dangerous. First responders should communicate with utility company personnel as soon as possible to ensure they can proceed safely. Once a line is de-energized, it is safe for emergency workers to perform rescue and recovery, provide traffic control, and manage possible life-threatening situations. The first responder to a traffic accident involving downed power lines, whether on the ground or car, faces two possibilities of a deadly electric shock. One of them is a “step potential,” and the other is a “touch potential.” In both cases, the emergency responder puts him or herself in danger of becoming a path for the electricity to move through one’s body and cause serious or fatal injuries. The term potential, as used with electric current, indicates a difference in voltage, and since electricity flows from higher voltage to lower voltage, a person whose body connects those two points will become the path for the current to flow. A step potential can injure or kill someone walking toward or away from the point where an energized wire makes contact with the ground. As the electricity flows through the soil, which has resistance, the voltage dissipates the further it goes. By striding across the affected area, an emergency responder could have each foot in different voltage zones, and a fatal charge could travel up one leg and down the other to the area of the lesser voltage. A touch potential can similarly injure someone standing on the ground that may have a lesser voltage than a vehicle draped with energized wires. While the victims in such a vehicle are at a single voltage, the difference between that and the voltage in the ground can be fatal to an emergency responder. When responding to an accident scene involving auto and downed lines, stay back and warn others to stay back. Make sure the occupants of the car stay inside until the utility has arrived to de-energize the lines. In a rare circumstance, the vehicle may catch fire. The only way the occupants can safely exit is to jump free and clear without touching the vehicle and ground simultaneously. Advise them to jump and land with feet together then hop away to safety.